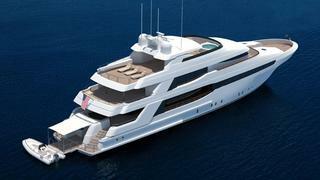 Neal Esterly at Fraser Yachts in San Diego tells me that the Canadian courts now desire that his central listing, a 43.9m Crescent 144 motor yacht currently under construction at the Crescent yard in Vancouver, is sold promptly. Naval architecture is by Jack Sarin, and her contemporary, yet timeless, exterior and interior styling and layout by Jonathan Quinn Barnett. She is being built in composite, with particular attention being given to achieving low sound and vibration levels. Accommodation is for ten guests in five generous staterooms plus up to nine crew in five cabins. One of her most notable features, of which there are many, is the large fold down transom door that transforms the swim platform into a portable beach for lounging and easy access to the water and tenders. Construction is approximately 70% complete, with around 10 months of work remaining.